Following the daily postmarks for each of the Design A Stamp competition finalists, Royal Mail have told us that there will be a national postmark for each of the winners of the Christmas Stamp Design Competition. There is one each for Molly Robson and Rosie Hargreaves. 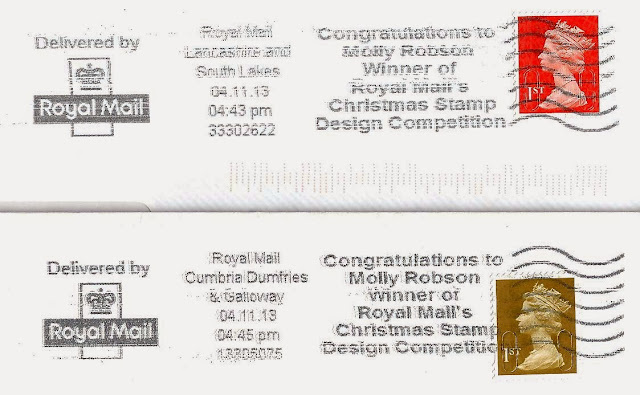 Their postmarks will feature on mail delivered from November 5th (Molly) and November 12th (Rosie). This means that the postmarks started in use yesterday Monday November 4th (I didn't get one this morning) so please send examples from any office on any day, and we'll post them here later today or when we get back from Stafford at the weekend. Less than 90 minutes have passed and I can now show the first images from Mike M and John E - thanks guys! Unfortunately mid-Norfolk's post is handled by Norwich mail centre which doesn't have the facility to add slogans like these, and the news was too late for any of our contacts to send me a first day cover with this slogan. But one of our contributors in Glasgow was more fortunate and has sent this image over a FDC posted from Birmingham. The slogan isn't as clear as it might have been, and the cover has suffered a little - perhaps it was raining. Nonetheless it is a desirable item, and as good as a CDS FDC as far as I am concerned. Has anybody got any spare ones? 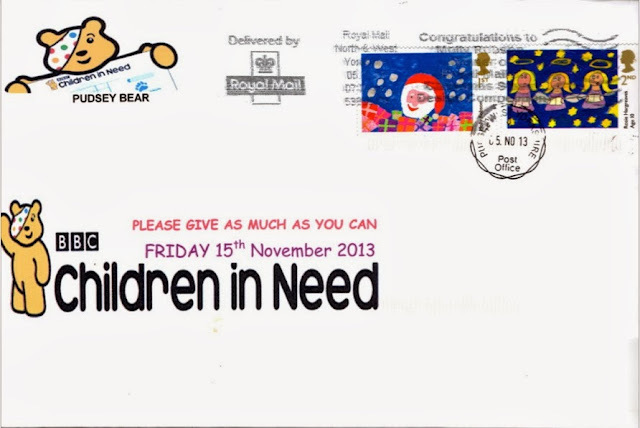 This FDC with the Pudsey CDS also has the North and West Yorkshire 'congratulations' slogan. 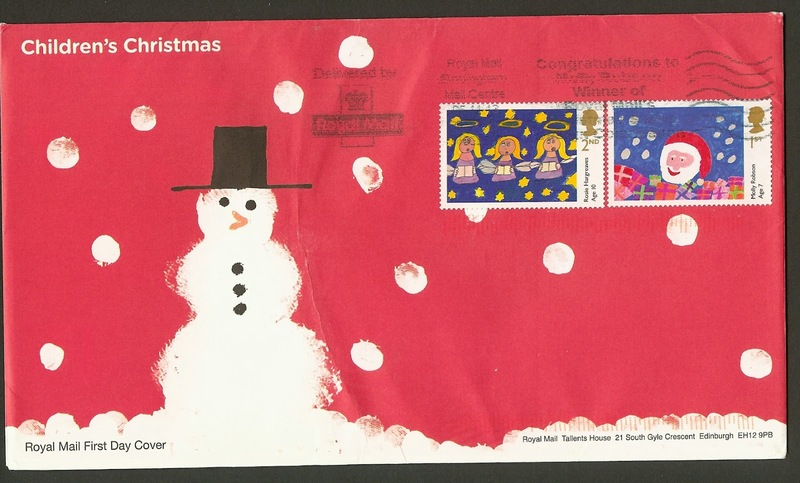 OK ... so we should have expected this given Royal Mail's past performance. Is / was there any way to get the stamps postmarked with the relevant postmark as a matched first day cover? That would be one with a premium value! Yes, post it today at in one of the areas covered by the type of postmark used - see this and previous postings for details of the areas covered. BUT - to guarantee that your FDC gets a postmark at all, I would suggest taking it to the relevant mail processing centre and handing it over, if you are lucky enough to be in one of those areas. I couldn't get to Cambridge in time sadly, even if I wanted to.